Amidst the cacophony of news and noise around immigration in this country, it is easy to feel overwhelmed and helpless these days. The current crisis of children being separated from their families and held in detention centers is yet one more deeply unsettling reality. And regardless of where we land on the political spectrum of policy and practices there is a kingdom reality that unites us all, and which I believe can move us forward, together. As Episcopalians, at the time of baptism we make 5 promises- the first three are focused on ourselves- promises to learn and grow in the context of a faith community, to seek and ask for forgiveness when needed and to be about the Good News in all we say and do. They are promises of formation; ways in which we choose to structure how we live and grow as Christians. Likewise, the last two promises shape who we are, and they carry extra weight these days for me in light of how out-of-control the world seems to be spinning. And to each of the five questions the response is: I will, with God’s help. It is in that response we find hope, remembering we are not expected to walk this road alone. Left to our own devices we will surely fail to discover a better future than much of the reality and mess we have made today. But clinging to the conviction of these promises made in the context of a faith community, especially these last two, gives us a path forward with clarity and purpose. Following Jesus means following a path of love- the “I am willing to put you first; I will fight with and for you; I will listen more and talk less; I will move over so you have a place at the table too” kind of love. 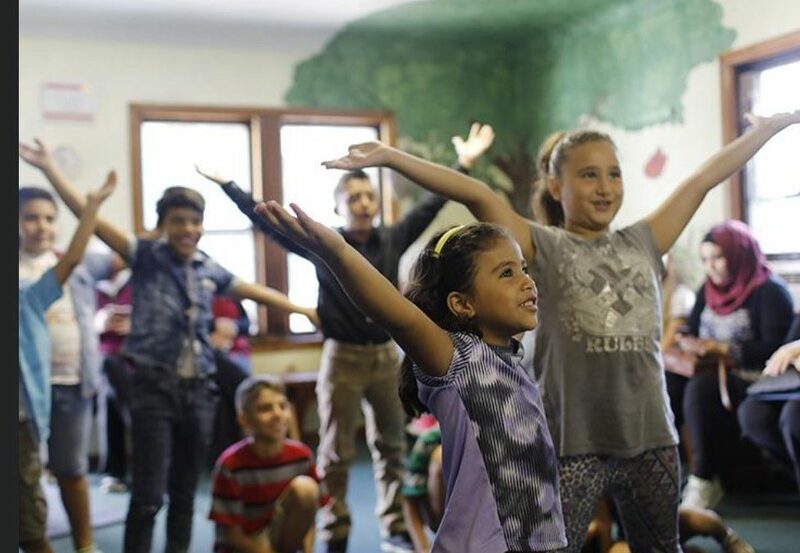 So how wonderful is it that next week we will exercise those promises and that kind of love, with God’s help, as we open our doors to host “Sharing the Dream”- a weeklong summer camp experience for Syrian refugee children and youth. Working with local musicians, artists and US Together, Inc- a local organization assisting and advocating for immigrants and refugees in central Ohio, Trinity will roll up its sleeves and walk the way of love all week. Come home Sunday and hear more about this exciting week coming up- and all the ways we can be a part of extending that welcome. But first, come home to be fed and reminded that you are loved and cherished just as you are- broken and blessed- flawed and called- a beautiful work in progress- all welcome and wanted!